~The Simple Sophisticate, episode #187 ~Subscribe to The Simple Sophisticate: iTunes | Stitcher | iHeartRadio ~The following episode/post is part of the year-long series Welcoming in the Quality in 2017, One Month at a Time. To view other monthly topics touching on all arenas of our lives from style to money to eating well, click here. Upon stepping off the plane […] Listen now or continue reading below. ~The following episode/post is part of the year-long series Welcoming in the Quality in 2017, One Month at a Time. To view other monthly topics touching on all arenas of our lives from style to money to eating well, click here. Upon stepping off the plane at Heathrow last month and wandering into the Devon countryside for a week, I also drastically limited my access to American news. My focus was initially on successfully arriving at my destinations, not missing my train, exploring desired sites and soaking in all of the beauty of the landscape and the culture. While I did turn on the BBC from time to time out of curiosity of what Britain’s culture was focused on and their observations as an outsider of American news, I did so for brief windows of time each morning and evening. Stepping out of my routine of regularly having news radio on in the background while working and scanning my social media, which prior to my trip contained a long list of news sources that I would frequently check out throughout the day happening without conscious intention initially, and going about my days with this new unconscious habit revealed a lightness about my day that I haven’t experienced for some time. Due to this observation upon arriving back in the states, I set out to revamp how I took in the news. Now at this point in the post, some readers may be nodding their heads and going so far as to say, “I never read/watch/view the news. It’s so depressing.” And while, yes, it can be tempting to refrain from all sources of news and go about our days in our own bubble, I would advise that it would be dangerous to do so. As I have shared in 2012, staying abreast of current events is, at its core, crucial to being an informed citizen. And to toss away the power to be able to think critically is a foundational component of living well and creating a world for ourselves and around us now and in the future that we wish to live. In 2020, the United States will celebrate the 100th anniversary of the 19th amendment (women’s suffrage), and to understand the struggle and suppression women fought to rise above should never be forgotten. Our voices are reflected in our vote and with such a powerful responsibility, we must stay informed. However, there is a healthy balance to be struck, and while I do need to stay abreast of the news for my teaching curriculum as well as for my own knowledge, I became determined to find a better way of staying informed without decreasing the quality of my life. In a study by the University of Sussex, researchers found that indeed viewing negative news has a negative effect on our well-being. However, as it is important to remain an informed citizen, how does one balance the two? As mentioned above, I wrote a post regarding the benefits of staying abreast of the current events of the day, and the last reason is a point I want to break down and examine today: become an educated citizen. It can be tempting to ignore news all together. The positive effects on your mind, and lightness of being will be immediately felt as I discovered during my week long holiday in England. But, when we say no to all news, we also say no to progress, not only improving our own lives, but the lives of those we love, the lives of the generations which will come after us and the quality of life and the quality of the world and the environment of which we call home. Each of us will make different changes, so it is important to understand ourselves and how/why we do welcome excessive news into our lives. With the first suggestion, we will drill down to the core of the shift that needs to be made and then follow with eight more ideas for striking a healthy balance that elevates the quality of your everyday without leaving you in the dark. Come to understand the cue and why you respond the way you do. What is the reward you think you are going to receive? 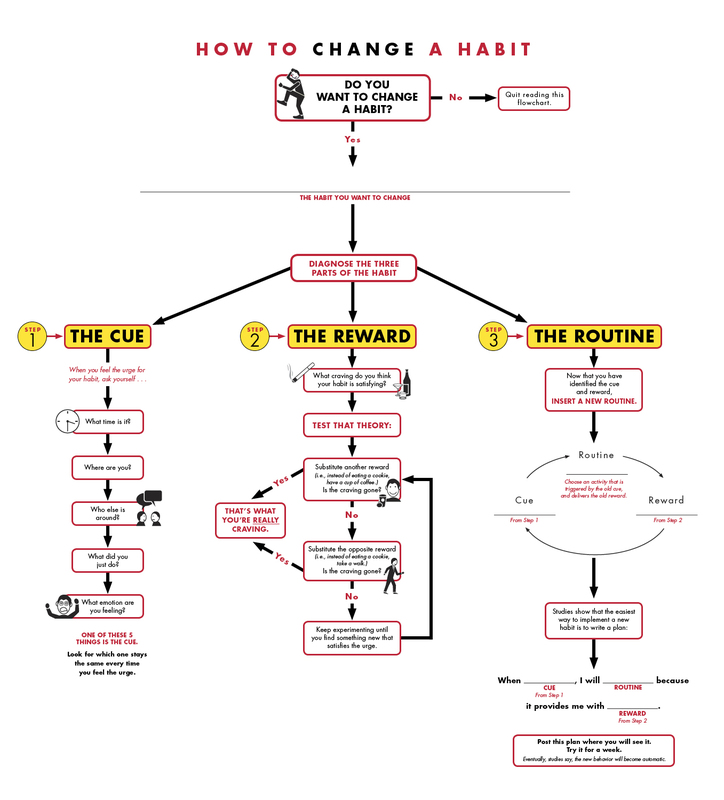 Pulitzer Prize winning journalist and author Charles Duhigg wrote The Power of Habit, and within the book he explains how habits occur and how to break them if they are not serving us well. It comes down to understanding the three part cycle: Cue, Reward, Routine (see the detailed graphic here). Part of why I turn on the radio, the news, or scan my social media to stay apprised of current events, is that it is part of my routine. Within in that routine, I am seeking a particular outcome. In other words, I am craving something that I think this habit will satisfy. Once I identified that I wanted to learn, and knowing that this routine is not procurring the outcome I actually desire, I can shift the routine. But first, I needed to understand the cue that shifted my attention to feeling the need to stay aware or learn something. Also, in some moments during the day (because he suggests looking at the time of day in which the habit takes place), it was merely to have background company while I worked. Understanding these three components is a significant step toward altering the habit that you’ve discovered, in this case watching, reading or hearing too much news. In the following steps we’ll talk about how to create new habits that satiate the craving. While yes, the news is meant to inform (find the who, what, when, where and the why), the networks/channels need to keep you watching as each station is funded by advertiser dollars (BBC and PBS being exceptions) and thus, need to keep your eyeballs on the television for as long as possible. Often the “why” is something that cannot be answered immediately; however, the anchors would like you to think they can find the answer: the answer will reveal itself with the next guest that will be chatting in the next segment, and that is one way to keep you tuned in. Either view a neutral news site or challenge yourself to view the opposing columnists, news sites, opinions and commentaries to better understand their argument. One assignment I give my rhetoric students each year is to read a columnist who leans to the left on political issues (domestic and international) for the first semester, followed by reading a columnist from the opposing side the second (have a look at the list here – I am always adding to and tweaking it). I too continue to read columnists from the left and right to better understand the issues at a level that is far deeper than the short talking points shared in headlines, comment sections, etc. Often, what I find is that I become a bit calmer after reading the opposition (credible source is a must) as the fear mongering has been reduced and I am able to better understand why the other side adheres to their ideology on a particular topic. Another site I would recommend you checking out to view multiple sides of issues is a source our school’s librarian has shared with our staff: AllSides. As you will see, it is organized just as the name alludes: each column is placed on its respective place on the continuum, so you can have at your fingertips, multiple sources and opinions about a current event topic. Part of the fear and angst that intensifies is due to a lack of knowledge of what has happened in the past. A deep understanding. The cause, the effect. It’s one thing to memorize the dates of events, but its another to understand the catalyst that led to the event occurring and the outcome that followed. This takes time. This requires more than a viewing of a three minute segment on the news. Pick up a book on a topic that interests you that has parallels to the issues that matter to you and dive deep into the archives of history. Perhaps turning off the notifications on your phone is the first step toward change that will limit your stress. Then look to how you are receiving the news: social media or newspapers; radio or television? Often we take in news without being prepared to receive it. In other words, we are passive receivers of the news – we are letting the news come to us when it wants to arrive. Instead, choose to be an active receiver. Choose when and how you will receive the news of the day. I prefer the radio and the newspaper as I have more control as to when I am ready to learn what is going on in the world. I recently went through my Twitter account and unfollowed nearly 100 different people who were associated with news or world events that typically shared information that stressed me out to read. Now my feed contains primarily inspiring, trusted and less inflammatory sources of individuals. I also have chosen to receive a daily news email that arrives in my inbox each morning (rather than alerts), so that I can determine when I see the news and prepare myself for it, read it, and move forward with my day. Most major news sites have an email subscription service like this. Some even have daily podcast episodes: short and current – such as NPR’s Up First app (10 minute rundown each weekday morning with the Morning Edition team). The Daily Skimm is another great news source to receive the headlines of the day upon waking up to start your day. Another idea that will also tickle your interest of other cultures is to read the news through the lense of another country. Part of the reason I enjoyed the news a bit more in England was the distance and perspective an outsider gave to the perceived pressing issues of the United States. 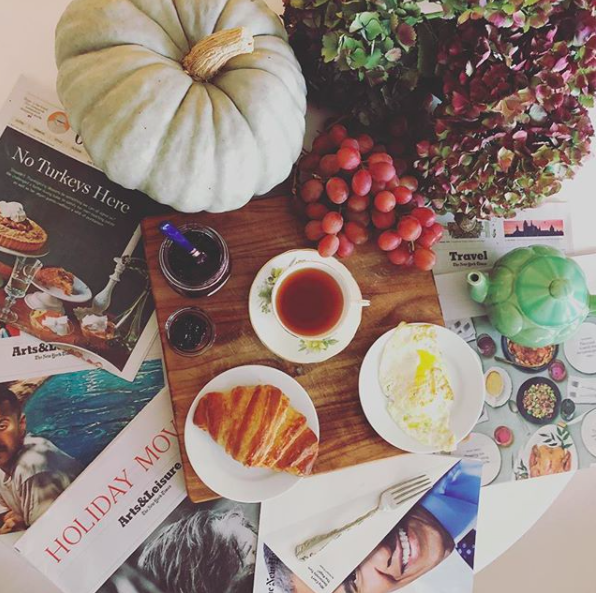 One show I thoroughly enjoy each week is Sunday’s Weekend Edition on NPR: the puzzle with Will Shortz, the music and book interviews, as well as a glance at world and domestic news and politics. Also, CBS’s Sunday Morning with Jane Pauley. However, once I’ve heard or viewed them, the radio and television goes off and I enjoy my leisurely or project-driven day to do as I please without rachetting up the worry. As I mentioned at the top of the post, part of the reason I sought out the news was to continue my learning, but as I knew but didn’t apply, there are many other ways and sources to garner knowledge. Perhaps you have a list of blogs you read each morning or once a week, or maybe you view a particular show or public television program that tickles your fancy for travel or history or antiques or art or the list could go on for some time which means there is a wealth of ways we can welcome knowledge into our lives. Carve out time for these activities as they are a healthy choice for living well and staying informed. Often part of the reason the abundance of news we receive overwhelms us is that we feel helpless. And while we may not be a politician or an individual who holds a seat in government at the moment, why not do something that supports the cause or causes you believe in. Begin by donating or volunteering your time, but in all sincerity, why not consider running for an office locally? Or if you are someone who prefers to stay behind the scenes, investigate who is running for offices in your local community, state or your state’s federally elected senate and representative seats and see how you can support them. Classical music, walking, reading a different section of the newspaper, reading deeper more investigative articles rather than viewing snippets on the news, all of these are ideas I incorporate into my life and now I have added a few more. I recently shared on Instagram Stories that I found the app I have been looking for for months: WRTI, a classical and jazz music station based in Philadelphia (an NPR affiliate). The primary reason I am most a fan of this app is that it has an alarm clock to enable me to wake up to classical music rather than the news radio app I used to use or a beeping sound (it also has a sleep timer). I tend to listen to classic music in the morning and jazz during my work day. If you have found alternatives that are working for you, please do share, as each of us will design the balance of staying informed and reducing stress thereby elevating the overall quality of our lives in our own unique way, and the more ideas, the more options to see what might work best. While my shift is fairly recent and I will continue to share my progress and the changes I observe, I have already noticed a return (or maintenance) of the lightness I so enjoyed while exploring and relaxing in the English countryside. I am certain we all can strike the right balance so long as we know how. And in so doing, continuing to fine tune the dial, we will find the precise spot that works best for us individually. 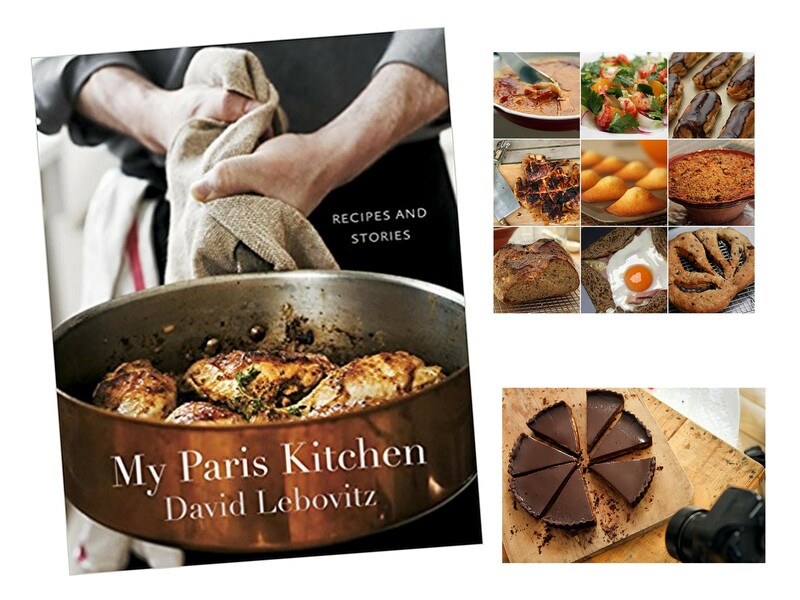 ~Listen to my interview with David Leibovitz (episode #182) about his recent book L’Appart in which the purchase and renovation of his now Paris apartment which took place while he was trying to write and publish My Paris Kitchen. Excellent. I’m amazed at the number of people who don’t appreciate what it took to get the right to vote, and adopt the “the news depresses me” attitude. Or, even on a civic level, are very uninformed yet vote anyway. Hello and thank you for stopping by. I appreciate your comment. Thanks for posting this — you’ve given us a lot of excellent suggestions, and I plan to follow many of them. I’ve always made a point of staying informed about politics and current events, but I’ve never been through a year like this one. I used to be an optimistic, hopeful person, but this past year has worn me down. A friend who’s a therapist told me recently that her practice is booming — because so many people are stressed out about the state of our country. How sad is that? Everyone I know is on edge, and you can’t talk about current events without igniting an angry debate. There are weeks when I try ignoring the news completely, and retreating to my own private world or spending time only with dear friends who share my viewpoint. But I know this isn’t realistic or helpful. It’s hard to lose faith in one’s country. I’m trying to stay hopeful and confident that this too shall pass. Thanks again for offering new ways to cope with the madness. I enjoy your blog! After a restless night that was cluttered with names from the news, I was happy to listen to this measured approach to staying informed. Thank you! I concur with your comments. It is challenging to watch the news at the moment. I’m based in England and we have our issues post Brexit which are not always well represented by the media. I always thought being up to date on politics was crucial to who I am but in the last year, I’ve realised I have to set the contemporary politics in a wider context. Becoming more immersed again in the Arts has become more necessary as has choosing who I get my news from. We are lucky to have the BBC radio programmes which offer humour and deeper explanation than TV or press are willing to do. Its a conundrum how to keep in touch without succumbing to effects of fake news or worse. Its a challenge for us ordinary people to take on board but not to give up I think. It is also important to know we are in this together and it will move on again. I can’t thank you enough for this sensible & reasoned post. I’ve always been both a news addict and an avid political junkie, but this past year has almost done me in. Like so many, I was so confident that sanity would prevail last November, but the world shifted under my feet & it’s taken me the past 12 months to stop crying, catch my breath & gear up for the fight for our lives — literally, the fight for people’s lives! Out of necessity, I have had to limit what I watch, what & whom I listen to, where I spend my time on the internet. I’ve turned toward good music, art, all manner of creative work & positive voices & viewpoints such as yours — while keeping an eye on the things I need to know to be an effective counter-force to the people who would do the entire world & everyone on her harm. Good & kindness will prevail, I truly believe that. But we all need to nurture & protect ourselves emotionally as diligently as we care for our physical health, & that means monitoring what we allow into our minds as closely as we monitor what we eat. I nearly exhausted myself with rage for the first part of this year. It’s not a healthy option, nor did it make me effective. I’m doing better now. And posts such as yours help more than I can say.